Renting DVDs from Redbox is still a way that most people choose to watch their beloved movies. But as you see, you must return your Redbox DVD rentals before 9pm the following day, or else there will be a late fee. And next time if you wanna watch this DVD disc again, you need pay again as well. Why pay anything for a DVD rental ever again? Ever tried to copy/rip DVDs? Is there a way around the Redbox DVD copy protection, so you can rip or copy rental DVD from Redbox without any hassle and keep them longer at no cost? This article shares how to rent a DVD from Redbox, rip it to digital copies and keep it forever. How to Rent DVD Movies from Redbox? At the mention of get some Redbox DVD rentals, Redbox kiosks would come to your mind firstly for sure. At a kiosk, you pick the movie you want, check it out and then return it when you're done with it. Redbox machines are cheap, easy to use, and widely available. But what if there are no Redbox machines nearby? How can you rent DVD movies from DVD rental site Redbox? Redbox online services will do you a favor. All you need to do is to visit Redbox homepage, find the available movies, click "Hold for Pickup", and visit Redbox Instant's homepage. Access to any types of DVD disc, including Redbox DVD rentals, the recently released DVD movies, DVDs with multiple false titles, TV series DVDs, workout DVDs, Disney DVDs, and other damaged or unplayable DVDs. Rip DVD to MP4, MOV, AVI, FLV, MPEG, H.264 or any other digital copy formats so that you can watch them on media players, iPhone iPad Android. Directly rip DVDs rented from Redbox to iPhone 8/7/7 Plus/6S/SE/6 Plus/5S/, Samsung Galaxy, Sony Xperia, Huawei, HTC mobiles or tablets etc. Speed up the DVD ripping process to the utmost, 16x faster than before, thanks to the high-threading and multi-core tech. 10 mins only for a full-length DVD movie without quality loss. Firstly you need download the free DVD ripper on your Mac computer. If you're willing to rip Redbox DVD free on your Windows PCs, MacX DVD Ripper for Windows is demand instead. Then here we go to get Redbox DVDs ripped. Step 1: Load A Redbox Rental DVD Movie. Insert your Redbox rented DVD disc to the DVD-ROM or your computer and launch MacX DVD Ripper Free and tap the DVD Disc to import the DVD movie. You can also load your ISO Image or DVD folder sources as well. After DVD loaded, the right title is selected automatically and there pops up a window for output format choosing. You're able to rip DVD to digital formats (MP4, MOV, AVI, FLV, MKV etc. ), convert DVD to iPhone IPad Android devices, extract audio from DVD movie etc. Tap the Browse button if you want to specify the output destination like hard drive, portable devices to save your ripped DVD. Then hit RUN button to start ripping DVD rental at Redbox free. 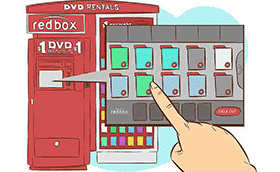 Q1: My Redbox rented DVD won't play, what should I do? 1. Is it possible that you're trying to play a Blu-ray Disc in a standard DVD player? Blu-ray Discs will only play in Blu-ray compatible players. You can tell if it's a Blu-ray Disc because the downward-facing side of it will be blue instead of silver, and it'll have a Blu-ray logo on top. 3. If you've tried to clean it and it still won't play, it might be scratched. You can try to fix scratched DVD with the DVD repairing tool. Or report your unplayable disc here and we'll help you out. Q2: How long is the Redbox DVD rental period? A: Want to hold onto your disc for longer? No problem. For each day you keep a rental, you'll be charged for another rental period + applicable tax. If you hold onto your disc for the maximum rental period (almost everywhere, it's 17 days for movies and 23 days for games), you'll be charged the maximum charge and the disc is yours to keep. Q3: What happens if I return a movie or game after 9:00 p.m.? A: You'll be charged for another rental day plus any applicable tax. If you only want to pay for one rental day, be sure to return your disc to any Redbox location before 9:00 p.m. the day after you rent it. Q4: Do I have to return my movie or video game to the same box I rented it from? A: Nope. You can return your movie or video game to any box in the U.S. Use the Find a Redbox Location tool to find all the Redbox locations near you. You can also get the Redbox mobile app to find nearby locations when you're out and about. 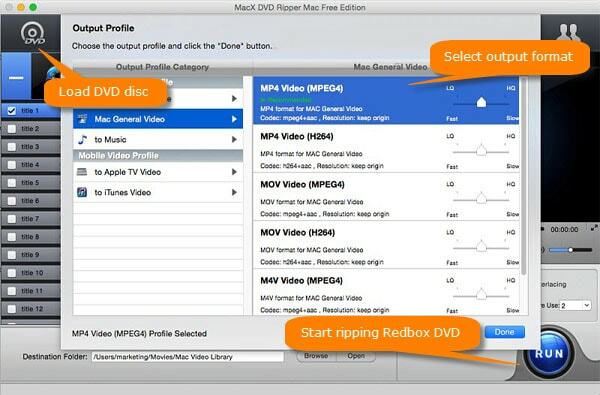 Best free DVD ripper - MacX DVD Ripper Free enables users to freely rip Redbox DVD rental to MP4, MOV, M4V, MKV and more formats with high quality reserved, so that you are no longer worried about Redbox DVD rental late fee and able to keep it forever. Easily Copy/Rip Redbox DVD Rental to MP4, MOV, MKV etc.